As the population ages, which nation will rise to lead innovation in the future? 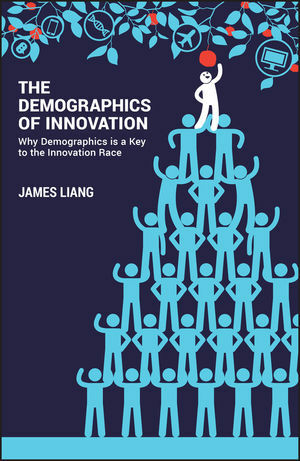 Demographics of Innovation takes a deep, investigative look at the link between economic growth, innovation, vitality and entrepreneurship in an aging population, and provides smart strategy for the future. Written by a Stanford-trained economist and demographics expert, who is also a prominent internet entrepreneur, this book examines demographic trends across nations and digs into the divergence to find awakening innovation. An aging population hampers growth; while many are focused on the care-related financial burden, few have fully explored the ways in which a seismic demographic shift could transform the face of global business. This book charts the trends, connects the dots and reveals which nations will be best placed to build an innovation economy and grow in the future. Global business is set to undergo a revolution as aging populations mired in old thinking become left behind by younger, brighter, more forward-looking generations. Innovation loss is the first step in stagnation, so the question becomes: who will win and who will lose in this new world order? This book presents clear analysis of the coming demographic bomb, and proposes insightful strategy for the short and long term. The problems of overpopulation pale in comparison to the problem of aging on a massive global scale. Demographics dictate growth rates, economic equilibrium, interest rates and so much more. Demographics of Innovation provides thought-provoking analysis and strategy for policy makers, business leaders, investors, entrepreneurs and everyone concerned about planning for an uncertain future. JAMES LIANG, PhD, is both a prominent business leader and an accomplished economist. He is the co-founder and Chairman of the Board of Ctrip, now China's largest travel portal. James is also a professor at Peking University. As a trained economist and founder of successful Internet companies, he brings his unique insight and academic rigor to The Demographics of Innovation. James is a leading authority on demographics issues in the world.